For some reason I have been sort of fixated on how to create a nice wintry feel in an image without getting fake falling and unnatural looking snow. This week I will show a couple ways I use to create a more natural snow and piling up effect in my images. Its a lot in the brushes! The image above is of a pretty red budded plant (unable to find the name in my resources) that was growing at the Harry P. Leu Gardens in Orlando, Florida. In a short Corey Barker video called Corey’s Universal Particle Brush video, a fabulous brush was created to add the falling snow in exactly the places it needs to be. Corey gives very clear steps to creating this brush that uses PS Noise Filter, PS Gaussian Blur, a Levels Adjustment, and Gradient Tool to make the basic brush. Then changes are made in the Brush Panel to the Shape Dynamics, Scattering, Transparency, and Brush Tip sections. 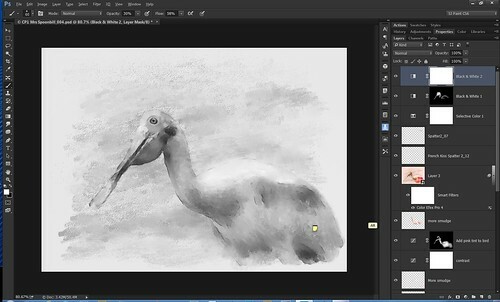 This brush was then saved as both a brush and Tool Preset – size is 1000 pixels. Corey uses this brush not for just snow but anywhere that particles are needed like fire sparks and rain effects. Now to processing the image. Once some random flakes are added to the image, Corey suggested adding a subtle Motion Blur to the flakes (Angle 75 and Distance 11) which makes the flakes look more realistic without doing anything else. Add a New Layer and make the brush smaller (500 pixels) to build up more dense snow around the plant branches. The layer opacity can be controlled for each snow layer to give the effect wanted. Also layer masks can be added to remove flakes where unwanted. A stamped layer was placed on top (CTRL+SHIFT+ALT+E) and Topaz (for website link see sidebar at my Tidbits Blog) Black & White Effects was opened. In the filter, the Local Adjustments brush section was used to bring back the color in the image where I wanted it. The filter’s Color Brush was used to paint in the red buds and using a lower opacity, the green leaves were painted in. This softened the background a lot but color could still be introduced – in PS the layer opacity was set to 76%. On a New Layer more snow was painted in using the smaller sized Particle Snow brush again. This is how the lower leaves show snow building up on the leaves. 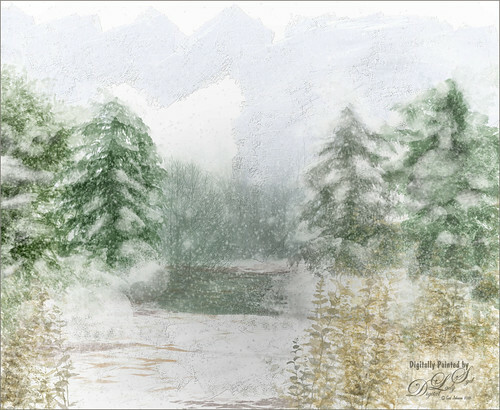 A basic Mixer brush was used on a New Layer to add dabs of white paint for snow – I used Fay Sirkis’s Pet Pastel Underpainting Highlight Photoshop brush (I can’t seem to locate a resource with her brushes right now). But any small sized Mixer brush (45 pixels) will probably work – in the Options Bar set the mixer combination field to Dry and turn on the Load the Brush After Each Stroke with the color set to the snow color and just paint in the snow. Next a text layer with some icicles hanging from the letters were added on layers above using the free Frostbo Ice Brush 01 for the icicles. The last step was a Levels Adjustment Layer to adjust the contrast. I feel like this plant looks like it is in a “winter wonderland” and not a sunny Florida garden. 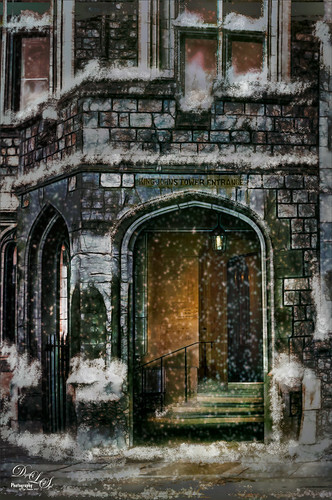 This image of the St. Johns Tower Entrance to apartments at Windsor Castle turned out to be lots of fun to convert to a spooky winter image. The original image was taken on a sunny day in August so it has definitely been winterized. First Topaz Clarity was used to sharpen the image overall. Then the Adaptive Wide Angle Filter, Topaz Glow, and Lucis Pro were all used to get a really sharp and correct image. At this point I was just trying out different plug-ins and this is what I ended up using. Now the snow was painted in. A free set of very basic star brushes was downloaded by KeReN-R on DeviantArt and 4 brushes were used to paint in a lot of the snow (Sample Brushes 4 – see next paragraph on how to adjust this brush, 6, 8, and 19). Also Grut’s FX Inky Leaks Bottle Topple and Romato brushes were used to give the wet slick look on the street and steps (many brushes in this set would make great snow brushes). This step was a lot of fun to do! At this point Corey’s Particle Brush could be used, but instead I took the image into Topaz Texture Effects 2 and used the Winter Day I preset which contains a snow texture. A Spot Mask was used on the entrance so it could be adjusted a little differently. Back in PS the layer was duplicated and a Gaussian Blur with radius set to 250 pixels to really blur the image. Then it was set to the Subtract blend mode. The same entrance area was painted out in a layer mask. This darkened the image down immensely. On a New Layer white was painted in the entrance and set to overlay blend mode. Another New Layer for snow was used and some snow effect painting around the doorway in front using the Grut Bottle Topple brush. On a stamped layer Nik Viveza 2 was used to really pull out the lighting effect in the doorway and to darken down the on the street. There was a lot of trial and error on this image and I personally believe that is how to actually pull this look together. I am using Sample Brush 4 in the KeReN-R Star Brushes a lot to get the nice piling up effect of snow. These settings were changed in the Brush Panel to get a really great snow smoothing and piling brush: In Brush Tip Shape: Change size from 773 px to 150 px and leave Spacing at 25%; check Shape Dynamics and set Angle Jitter to 9%; and leave all other settings alone. In the Options Bar turn on the icon next to the Opacity amount so pen pressure will increase or reduce the amount of snow added. This creates a really nice brush to build up snow in any image. 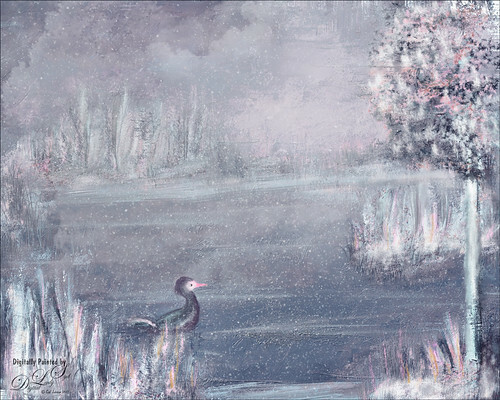 Above is an image I painted showing how a duck sees the beauty in his home during a light snow that we humans do not get a chance to appreciate. 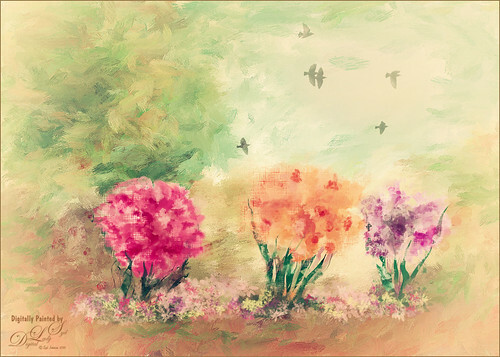 It was initially painted in Corel Painter by first adding a lot of the basic elements and grasses. Just enjoying painting at this point. Then the image was opened in PS and many more details were added. In this case the snow was painted in using Corey’s Particle Brush and the snow was built up using the Snow Build Up brush (sampled brush 4) and sampled brush 6. Many more plant elements were added along with the duck. Topaz ReStyle was used to change the color scheme from a warmer one to a color for a more wintry look. This is a good example of how to use these snow brushes when doing creative painting. Thought I would do a short post of my favorite images from the last year – have not done this in a while. For more info on photo adjustments, click on the image to go to Flickr where links to the original blogs are available. Hope you enjoy my favs! 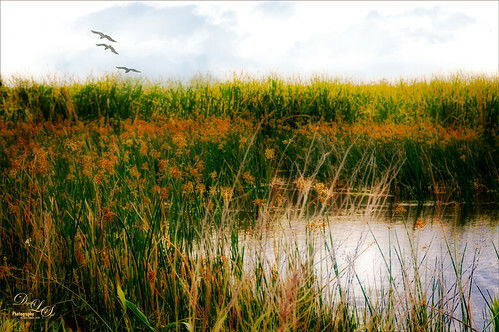 Image above is from the Viera Wetlands in Brevard County and used the Orton Effect. 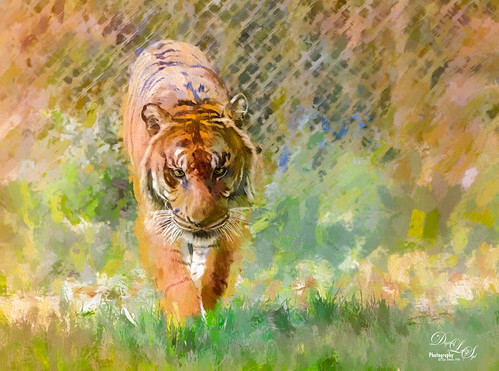 This beautiful Malayan Tiger was post-processed using the fabulous Topaz (for website link, go to my Tidbits Blog sidebar) Impression 2 filter. This is one of my favorite images created using Impression. 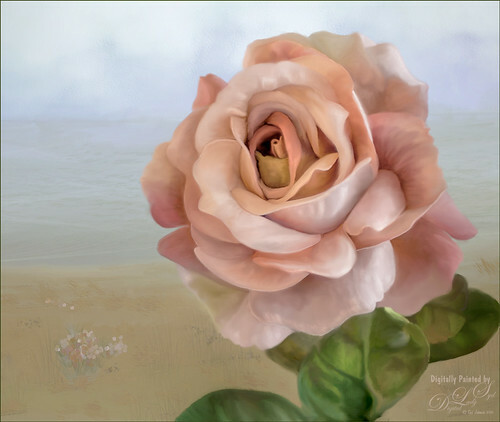 Image of this peach rose is one that was painted in Photoshop with the mixer brushes, and the background was created in Corel Painter – then the layers were stacked in PS. 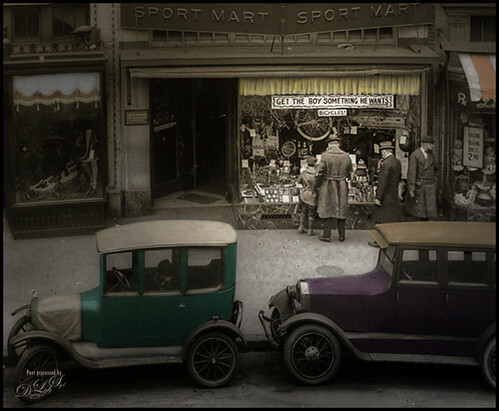 The original image was taken in Washington, DC, around 1922 was cropped and hand-tinted in Photoshop. I find it is really fun to hand-tint old images found at Shorpy.com. This is the Flagler Kenan Pavillion at the Flagler Museum in Palm Beach, Florida. It is one of the lightest, brightest rooms I have seen and is on the IntraCoastal Waterway. This effect was created with the no longer available Lucis Pro 6.0.9 Photoshop plug-in – too bad that in 2016 it finally became a reasonable purchase and then it discontinued. 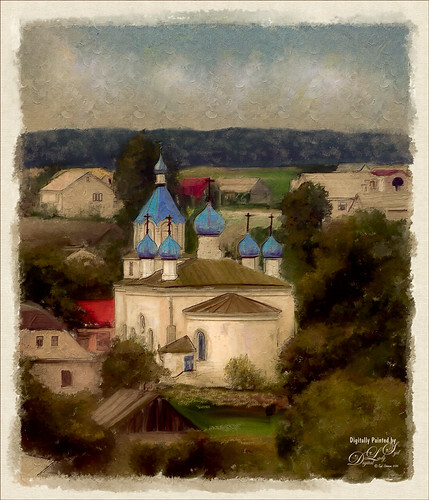 Image is of St. Trinity Church as seen from the Mir Castle in Belarus. This image was painted in Photoshop using Jack Davis’s painting action. 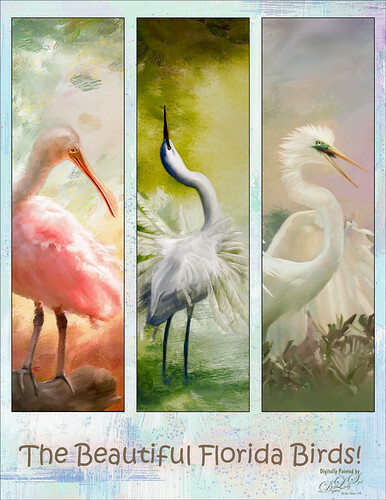 These three painted Florida birds are presented in a Lightroom template with the background added in Photoshop. 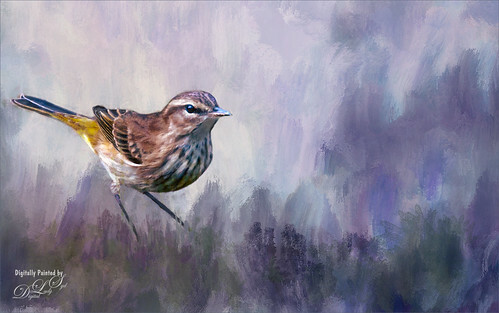 The birds were all painted in Photoshop and the bird backgrounds painted in Corel Painter. 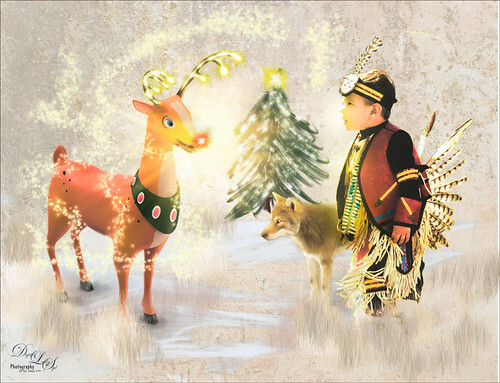 This image is an example of a composite that integrated several elements into a story. 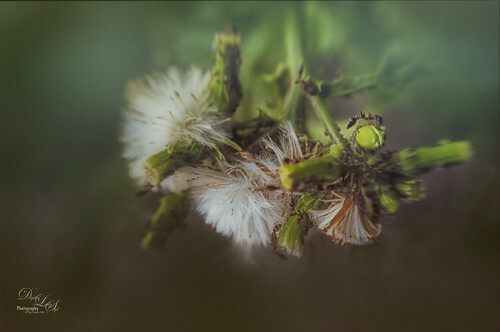 Image taken with a LensBaby Composer on my camera which gives a very lovely soft effect. 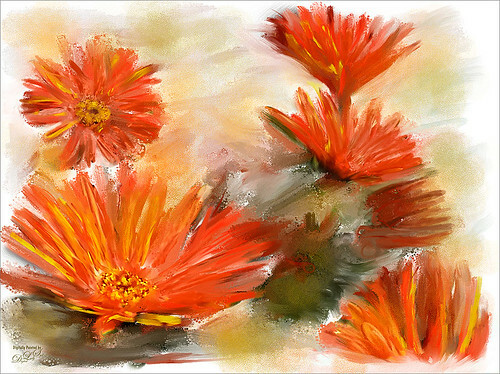 These flowers were painted in Paintstorm Studio, a really nice painting program. This week I have just been working on my flower painting skills. This is a beautiful Zinnia elegans with a Dahlia blossom in the lower left – I am looking forward to planting both in my yard later this month. I am now getting to a point that I can objectively see differences and similarities between painting in Painter and Photoshop. The painting technique used above is basically the same one I use on my various bird images, except I am painting the flowers in Corel Painter and finishing up in Photoshop. I am taking Karen Bonaker’s 2016 Painter Club at the Digital Art Academy and it really is a lot of fun. This month she is presenting a Blenders to Brushes class where she teaches you how to use different Painter brushes to create this effect. Of course, since I am a Photoshop person, I ended up finishing the composition in CS6 (which I and Karen prefer when using the Mixers in PS – the computer seems to paint much faster). I am finding that Painter brushes are definitely the most gorgeous, but the the basic program is a lot harder to manage than Photoshop (I can’t believe I am saying PS is easy to manage????) I am also using some PS tricks in Painter since the programs are similar in some respects (Layer Styles, Transforming, Blend Modes to name a few). I find selecting an item and using Layer Masks is much easier in Photoshop. And no Commit to Layer commands. In Painter a Mixer Pad with just black and white color swatches was created to quickly sample between the colors for working with a layer mask. And there is no way to view what the layer mask looks like on the image as in Photoshop (press the “\” key to see the colored overlay of the Layer Mask on the image). And I totally miss the Quick Mask selection tool in PS. Karen’s class supplies some wonderful brushes for this type of painting which produces a rather realistic painted rendition of the image. The other area that I am trying to figure out is exactly how Painter’s new Blending Panel relates to the Options Bar settings in PS. PS also has lots of presets choices – basically just need to know that if the word Dry is in the preset, it will be adding color if the Load Color icon is turned on; if the word Wet is shown, it will be mainly blending with Load Color icon turned off. Usually Sample All Layers is turned on unless the PS default Mixer Brush Cloning Paint Setup Action is run – then turn it off. These settings are very similar to using Painter’s Blending Panel Presets, new with the 2016 version. (Note the Blending Panel used to be called the Well Panel which does not have the presets.) One thing I do not like is how finicky the Blending Panel Preset field is – the Enhanced Blending Layers checkbox does not always work correctly and has to be reset by setting the Preset field back to Balanced and turning the checkbox on and off to get it to work. The Preset settings also do not save with down if a new brush is saved. And the Preset field is sticky, meaning if you go to a different brush and starting painting and the preset field is not set to Balanced, you can get some really weird results or none at all. Just beware if you use Painter’s Blending Panel Presets to always set them to Balanced before painting with a new brush. Sometimes I am just not using the presets and am adjusting the brushes manually. Definitely a glitch here that Painter needs to fix. The purple violets are just painted but with a more illustrated feel to them. Tried to change up the colors a little for a slightly different look. Same process – this time painted in Photoshop and using a Melissa Gallo texture. The difference is that Kyle T Webster’s Impasto brushes, the Oil Dry brush and the Palette Knife 1 brush along with his action and layer styles, were used to paint some impasto stroke effects into the flower petals. 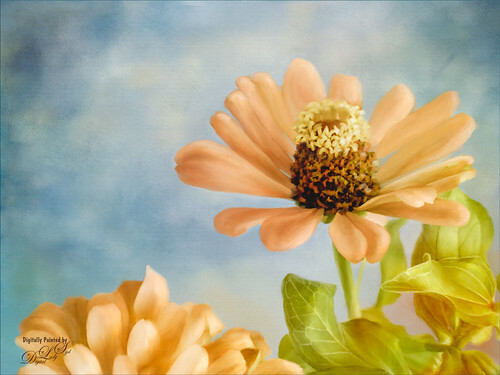 This is a similar technique used by John Derry and Melissa Gallo to get that impasto effect, but I am still experimenting with this effect. It does give the flowers a little different look! PHOTOSHOP MIXERS VS PAINTER BRUSHES! WHAT A DILEMMA! This week will be just having some fun and doing a little comparison between Photoshop Mixers and Corel Painter’s brushes, specifically John Lowther’s wonderful Landscape brushes. The image was taken at Pensacola Beach in Florida – the best beach in the US in my opinion. I lived there for a year and loved going to this beach! The above was completely painted with the Mixer brushes in Photoshop. 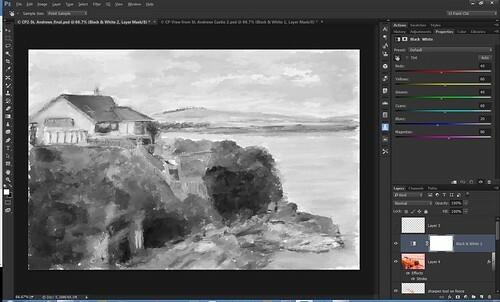 As I have stated before, I am one of those people that has a dilemma on which software program to use for painting. I am so comfortable with Photoshop that I can actually visualize what brushes I need to use to get the look I want. 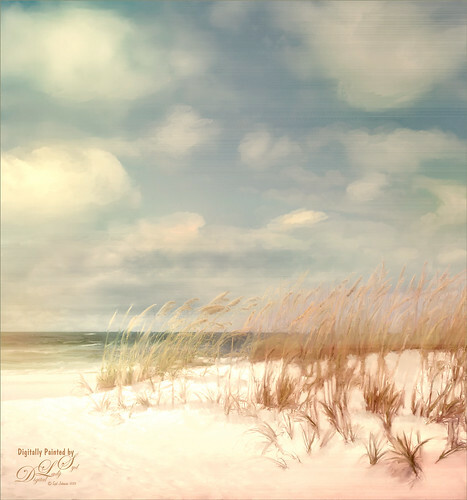 For my Photoshop painting, I like to use Fay Sirtis (a Corel Elite Master) Mixer brushes – if you are a KelbyOne member, at their Photoshop User site some of her brushes can still be downloaded from links under her older webcasts. I really love her Fays Portrait Pet Brushes set. A new free Breath of Sea Air texture from Jai Johnson (wonderful nature photographer and beautiful textures on her site) brought out a little bit of the wind blown feel at the beach and was set to Hard Light blend mode at 100% layer opacity. Also the sunlight effect on the left side was created using a fun little video by Glyn Dewis called Create a Sunset Glow with Photoshop. It really works! Now the biggest difference I see between the Mixers (not the regular Photoshop brushes} and Corel Painters beautiful brushes is that it is harder to dab a Mixer brush, although not impossible. With Mixers I find I usually have to stroke to paint onto the image, not just stamp it down. In Corel painter, you can get some fabulous results by just dabbing, especially with when using their Captured Dab Type. One of the confusing things is that there are so many brushes in Painter so you definitely need to keep track of your favorites. I think I have created over 20 palettes with different brushes. Not all brushes work using a full stroke – totally depends on which type of brush you are using. Painter has a very complicated “brush engine” with many panels controlling each brush. This gives some wonderful variations, even in the same brush. 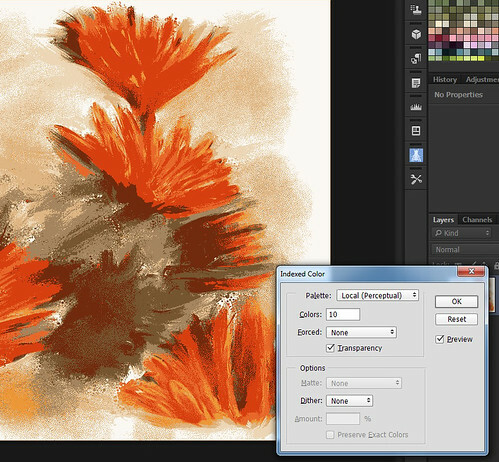 I find it really interesting that you can now add a Photoshop brush to Painter as a Captured Dab Type. I have not had a lot of time to try this out, but I did one brush and it turned out pretty good! 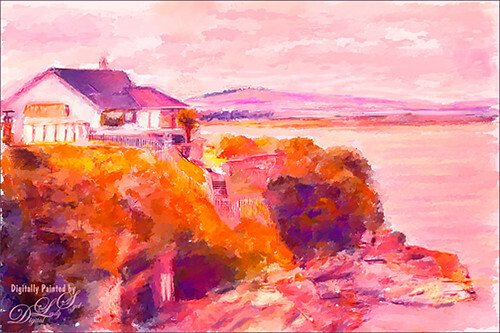 The image below uses John Lowther’s Landscape Painter brushes. It was really fun trying these brushes out, although they mainly seem directed toward creative art. But there are three cloner brushes in the set. Usually I clone an image in Painter, but this time the image was painted over as it seemed to work better. Therefore it is very similar to the workflow as the Photoshop Mixers. There are no rules to use. 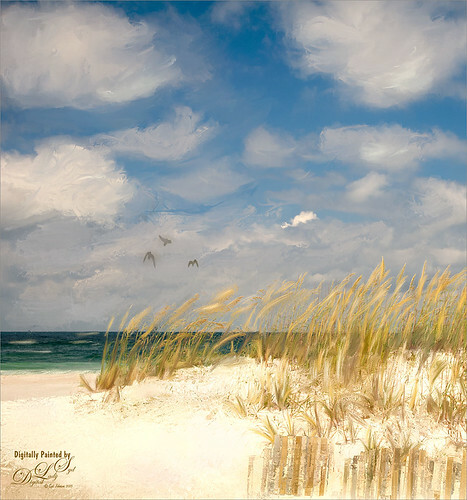 The Lowther brushes used were the cloud brushes, ground cover and grasses brushes to paint over sea oats, and a couple objects – mainly the fence and birds. I almost always go back to Photoshop to add the Contrast, and in this case a Color Balance Adjustment Layer, to the image and save. Still enjoying my summer so decided to present a couple of images that used both Painter and Photoshop, apparently my favorite way to process an image. 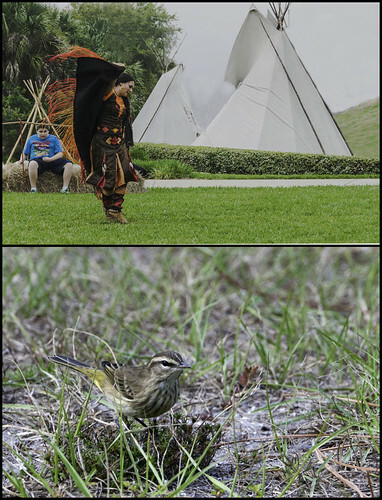 The dancer image was taken at the Annual Native American Festival at Ormond Beach, Florida – one of my favorite events for photographing. This lovely dancer is performing the Butterfly Dance (check out the link for the uplifting legend associated with this dance). It is definitely a difficult balance to achieve in an image that contains some detail and realism to it, but yet has a definite painterly quality. Both images took a long time to complete. I had trouble above getting the balance I wanted. I am glad I did not give up as it forced me to think about what was really wrong with it. 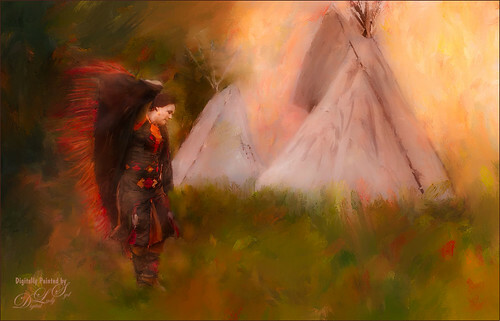 This image was actually opened in Corel Painter first – to get the colorful strokes in the background for the painterly feel. See below for the original image. Karen Sperling’s Artistry Quick Fix Video (#4 in this case) Series brush 02 was used to paint the texture along with a couple of her blenders. Then it was saved as a PSD file and taken into Photoshop to do a lot more work on this now rather roughed in image. Several layers were created and the Mixer brush and Smudge brush was used to further blend the background in. One of the textures I created previously was added and set to Color Burn blend mode at 15% layer opacity to add a slight gold tone. Here is where I had problems – I could not get her face to blend in nicely with the image – it stood out too sharp and bright. After trying a lot of different things in Photoshop, I decided to open an earlier RIF revision of the Corel Painter image. I wanted to soften the whole costume and face area. After trying a lot of different brushes, I ended up selecting Karen’s o1 brush with some brush modifications in the General, Well, and Color Variability Panels. Used lighter colors to blend and soften the dancer. The adjusted brush did the trick and this time the image was saved as a PSD file to use in Photoshop. Back in Photoshop just the top layer was copied and moved into my later image and set to Soft Light blend mode at 51% layer opacity. On a stamped layer, Topaz (see sidebar at my Tidbits Blog for website link) Lens Effects was used twice: once with the Diffusion Filter (Softness 0.41, Diffusion 0.25, and Edge Transition 0.50) to soften image overall; and then the Reflector Adjustments filter (set to Type Golden, Strength 0.34, Transition 0.62, Position 0.33, and Angle 208.5). A layer mask was applied so only the tents and sky got the warming effect – when the tents were lighter, it drew the eye to them instead of the dancer. A final check with a B&W Adjustment Layer to see if the focal point is set correctly, and it was not. Nik Viveza 2 was opened to tone down the white in the tents even more. Now the lady is just a little softer and blends better into the painted background behind her. Bottom line here – walk away, come back later, and try something radically different if you do not like the results. I am not sure why I took used an older Painter revision of the image to correct this issue, but it worked! A Tricolored Heron That Fell in a Painting! Now that I have been doing digital painting for a while, I am finding that the painting is only just a part of what has to be done to create a great image. This week I thought I would just cover a few of the techniques that are helping me get the contrast, and therefore the focal point, of my image exactly where I want it. The image above is of a house perched on a bluff in one of my very favorite places I have visited – St. Andrews, Scotland. This shot was actually taken from the ruins of St. Andrews Castle and the hills in the background are where the famous golf course is located. What a place to call home! This image actually took me out of my comfort zone a little due to the different color palette I chose, but I think I got across the effect I wanted in the painting. Recently I purchased Karen Sperling’s Landscape Painting brushes and video access. I am finding I like her style of painting – a bit more in line with what I like to do with my paintings. I am still enjoying painting more abstract looks too. Her brushes also work really well for me, and it was easy to follow her video steps to get some good results. But after painting, I was not sure about the focal point results. So we all know in most cases dark areas draw the eye as this is where the contrast in the image will appear. And logically the focal point will be somewhere around that area(s). Jason Maranto in his You Tube video series called Color For Painters has some great tips for understanding this concept. One of his suggestions is to make your image a black & white to accurately see where the contrast is going to be. He also stated that 95% of our color perception is based on the value – defined as everything between the darkest darks to the lightest lights in the image. So using Jason’s suggestion, a temporary Black and White Adjustment Layer was used in Photoshop to get this result shown below. 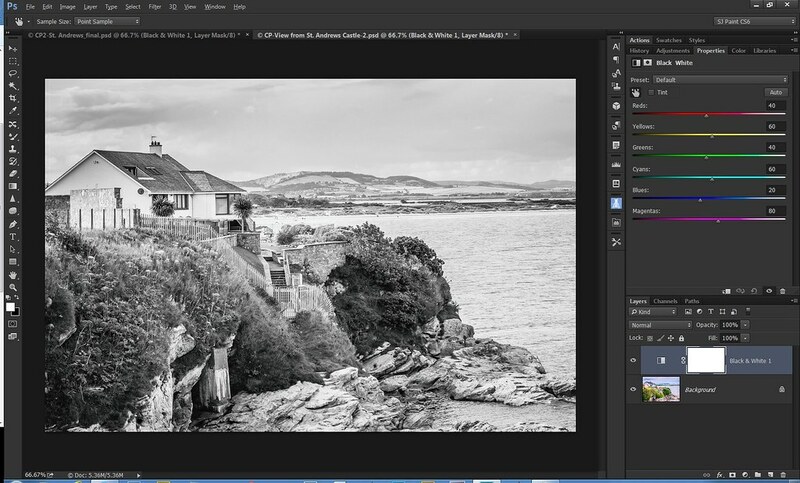 In this original B&W image, to me the eye goes straight to the dark part on the cliff, and secondarily to the lightest areas are on the house. I had originally thought the house would be my focal point. As you can see above it does stand out some, but the dark bushes are showing up even stronger. So as an aside, how did I get this rather wild color scheme? 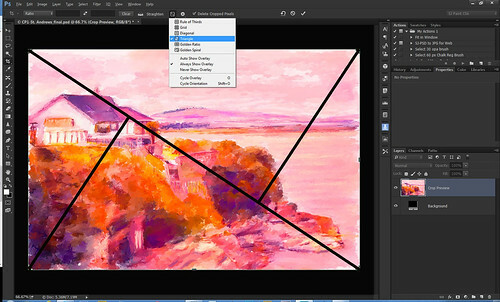 In Corel Painter 2015, you can add image sources to use for cloning colors other than the original ones. By adding Topaz (see website link at my Tidbits Blog sidebar) ReStyle into the Effects, different color themes can be observed without ever applying them to your image yet. (To add this filter, the Topaz ReStyle folder has to be copied into the Corel Program Files Plugins folder.) The Orange Peel preset was selected which created warm orange and yellow tones in a new source in the Clone Source Panel. I really like that you can change colors and see results before putting all that time into the painting. Also just the standard Basic Paper with the default settings were used in Painter. Once the image was painted, the white house sort of faded away a little. 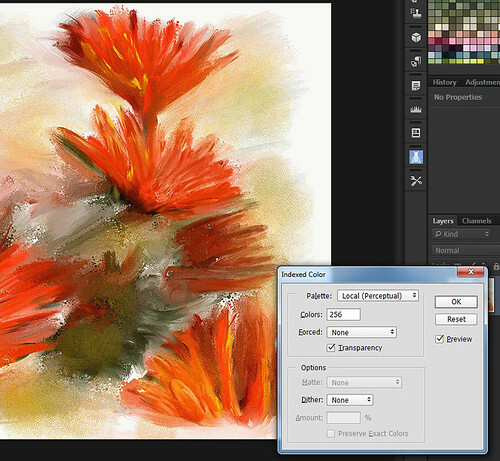 Here is the screenshot view after the image was painted showing the different values in the image. You can see the house does not appear quite so bright and the bushes are really popping. The dark bushes sort of scream focal point to me. I really wanted to show the connection of the stairs in the image as I could imagine myself climbing down them. Where my problem occurred was that the stairs did not exactly show up and did not fall on a point when following the Rule of Thirds. Instead the dark bushes lie exactly on a point. Note below that by selecting the Crop Tool and clicking in the options bar, the Triangle ratio (by opening up the drop-down, more options are available if the Rule of Thirds does not fit your image) actually fits this image and shows both the house and the dark bush as the focal points with the stairs sitting closely on the diagonal. The diagonal does works in this image and may explain why the composition does not look so unbalanced. Therefore, before cropping down your image, check out the other options to see if possibly the image is actually composed correctly or may give you a better crop choice. In this case, no crop was necessary. To try to further emphasize the focal points and diagonal, a few more steps were done. On a stamped layer (CTRL+ALT+SHIFT+E) that was turned into a Smart Object, the Camera Raw filter was opened and a Graduated Filter was used to darken just the sky so house stands out a little more – the house and hillside were painted back so the filter did not affect these areas. The dark bush area was still too over-powering. A New Layer was created to paint in a little more detail in the dark areas to break it up a little and add some interest. Next a light orange Overlay was loaded and set to Lighten blend mode at 35% layer opacity to lighten it up a little more – a black layer mask was added and only the dark contrast areas were painted back to soften and lighten this area. On another stamped layer Nik Viveza 2 was opened and control points were added to the dark areas where a little brightness and saturation was added in the dark areas. After this, a New Layer was added and the Sharpen Tool was used to sharpen the detail the fence area and steps a little more. Whew! These little tweaks can make all the difference in the image, but it takes a while to figure out which ones work. This image is of a beautiful Roseate Spoonbill that was doing a little photo shoot for me at the St. Augustine Alligator Farm Rookery a few weeks ago. I am assuming this is a female and she was actually busy at work setting up her household for the new babies, but took a moment to show off her beautiful spring fashion look. This image was also painted initially in Painter. I used one of Karen Sperling’s really nice brushes from her Portrait Painting set to get that feathery look, and basically hand-painted the whole image. Back in Photoshop a lot was done as I wanted a sort of illustrative feel to this one. Just used a Smudge Brush to really smooth out the distracting body lines. Nik Color Efex Pro was used and one of my favorite filters, White Neutralizer, was applied to tie the colors in better. As you can see below a Selective Color Adjustment Layer was added to tweak the Red-Pink colors to the exact colors I wanted. Then I applied the Black and White Adjustment Layer. The head and eye area did not stand out that great so I just started dragging in the image to get the contrast effect I liked. The white on her back was calmed down a little also. As you can see, the mask was turned to black and I painted back just the areas I wanted enhanced – that is the eye and head. 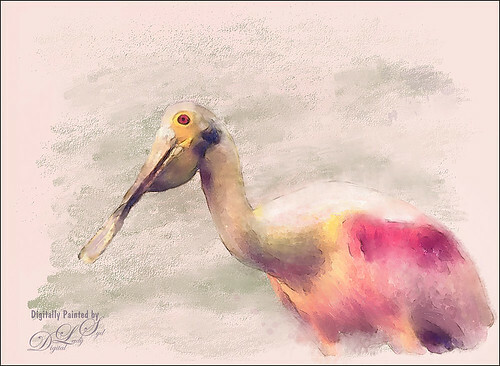 Turned the layer to Soft Light and there is my painted Spoonbill as seen above! As you can see, I had to use some different tricks to get this one to come out the way I wanted. Below is the screenshot of the final image in black and white so you can see the contrast in the image and that the head is the now the more prominent area and the white back not so distracting. There are a several other ways the color and saturation of parts of an image can be controlled. Color Balance Adjustment Layer or Curves Adjustment Layers used to lighten or darken different area by painting in black layer masks can really guide the eye through image and are easy to do. I use every trick I can find! Each image is so different. 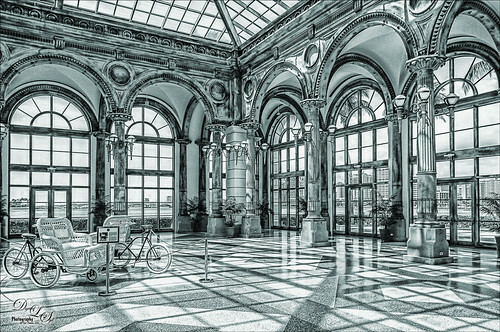 I think it is definitely a good first step to open a Black and White Adjustment Layer to see where your contrast really sits in the image, and then try to use it to your advantage. And it is not a bad idea to do it again after you have added your creative techniques to make sure the value did not change As in the spoonbill image, I actually added to my mage the Black & White Adjustment Layer to adjust the contrast correctly. Hope you get a chance to use this technique. I am trying to get in the habit of doing this regularly. Have a great week!…..Digital Lady Syd Digital Lady Syd Related Blogs: What About This Focal Point Issue? This technique involves opening up a favorite image in any format, and creating a color swatch from that image for use in your new creations. It is something most people do not realize can be done in Photoshop, and Corel Painter has a similar process for doing this. Apparently this option has been in Photoshop for a long time, but I just learned the basics from bittbox’s Jake Rocheleau in a blog called Build a Custom Photoshop Swatch from an Image. I am finding it is really nice to be able to sample the colors used in your favorite artist’s or photographer’s works. 1. First find an image that contains the colors you want to sample for use in your new creation. I opened up my image above to create swatch colors from since the orange colors are some of my favorites. 2. Now open up the Swatches Panel (Window -> Swatches) in Photoshop. 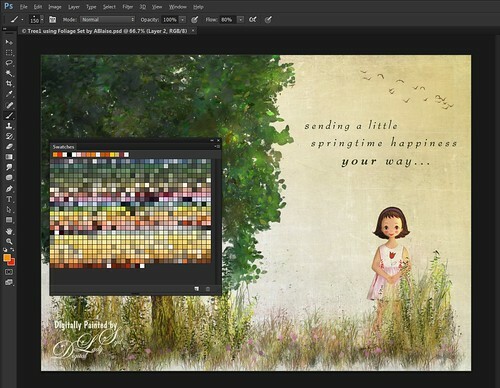 Click on the pop-out menu at the upper-right hand corner of the panel, select Save As and name your original swatches – I usually save with the date in it like 042515 Swatches in a file folder on my desktop called Photoshop Presets. This way, if you want to return to your originally loaded swatch colors easily, all you do is replace the current with the original ones you just saved. See below for more on the pop-out menu. 3. Go to Image -> Mode -> Indexed Color and select Local (Perceptual), which uses the color spectrum where the human eye is most sensitive. (Local-Selective optimizes colors for the web and Local-Adaptive reproduces the colors that occur most often in the image – other options to try.) In dialog make sure other drop-down fields are set to None (Forced, Matte and Dither). Now go to Colors field and try different amounts. This will be a live preview so depending on the number chosen determines how your image looks and how many swatches will be produced. For example, if set to 10 (see top image below), there are just a few colors shown in the image and only 10 color swatches will be made; set to 256 will give 256 color swatches and probably some colors that look very similar (see bottom image below). 4. Unfortunately we are not done – one would hope they would just load into the panel, but they do not. Go to Image -> Mode -> Color Table. There are now 256 swatches from the image since 256 Colors were entered in Step 3. (See image below.) You can delete some colors in the table by clicking on the eyedropper and then on colors you do not like or appear to be duplicated. This can also be done later so I did not do this now. The Color Table needs to be named (mine was named Mums for Painter) and in the Save Type As select .ACT file format. The image can be closed at this point. 5. Back in the Swatches pop-out menu, select Replace Swatches and in Load dialog, above the word Load button, change Swatches (.ACO) to Color Table (.ACT), which was the only file extension allowed in Step 4), and click Load button. If you want to change the ACT file to an ACO file, can now go into the pop-out menu and select Save Swatches and the file format will change to ACO. I do not know why there are two different extensions in this process as it is confusing. Just know that both ACT and ACO file extensions are color swatches. Select Replace Swatches to change from the original or current swatches to new one created. If you choose Load Swatches, the new ones will load underneath the current swatches already showing. Choose Reset Swatches to select the default color swatches that come with Photoshop. A choice comes up to either replace, or append the swatches which adds them at the bottom. Select Save Swatches to back up the ones already loaded so they can be restored at a later date or to change the Color Table (ACT) file extension to Swatches (ACO) file extension. If you find color swatches you want to remove, or if appended and want to change the swatch order, there is an easy way to do this. The Preset Manager can be used to do this. To open it, go to Edit -> Presets -> Preset Manager, or the easiest way to do this is to open the Brush Panel or Brush Picker Panel and click the Open Preset Manager icon at bottom of each (2nd icon over). In the drop-down Presets field at top, select Swatches. To remove a swatch color, click on the color to remove and then the Delete button. Also by CTRL or SHIFT clicking on the colors, you can remove a large group number of colors or drag and move them into a different order. I find this much easier than doing this while creating the Color Table. The Preset Manager will also save several swatch sets together into one set. The colors from your selected image are now available to use in new creations by just sampling the color swatches while painting. 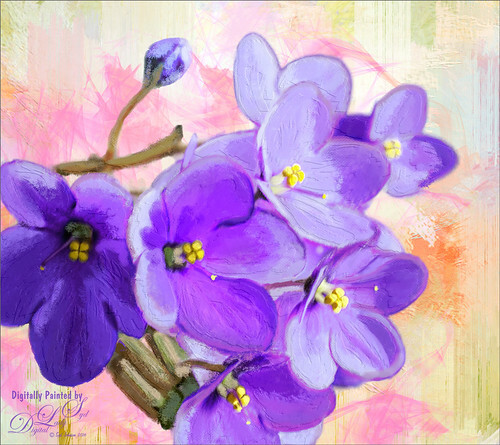 Below is an image used recently in my Tidbits Blog (see Springtime Wishes from Betsy) where I had set up three of my favorite images into a Color Swatch set in the Preset Manager. Using this grouping of colors seems to be improving my color choices since these colors all seem to go together nicely. The three images whose colors I created my Color Swatch set were from: Wild Roses and Irises by John La Farge, Sunrise by Phil Sabado (apparently the Sunrise painting is not circulation anymore but all his art is beautiful so his website is linked), and The Picnic Party by Jack Vetriano. The tree colors are definitely from Wild Roses and Irises and the soft reed colors are from The Picnic Party. I am using these specific swatches a lot for my creative images. Also, if you find you want to add a color not in the loaded Color Swatch set, at bottom of the Swatches Panel click the first icon, Create New Swatch of Foreground Color or right click in swatches and select Add New Preset – it loads at the end of color swatches. Right click on a color and select Delete Swatch to remove it. 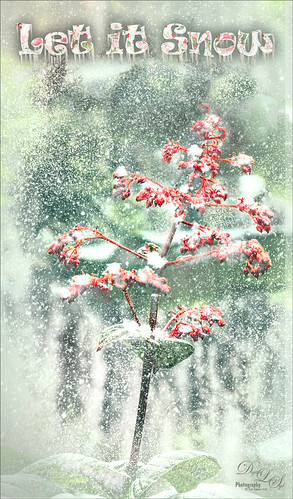 This image below was also from my Tidbits Blog (see A Wintry Scene) and used the same Color Swatch set. This time different green colors were used. The dark colors picked up the greenish dark tones and even the sky tends toward the cooler colors that improved the overall color quality. In Painter they are called Color Set Libraries instead of Color Swatches or Color Tables. 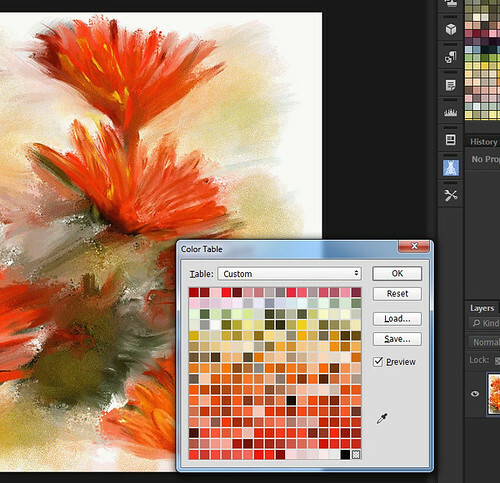 Open the image in Painter that you want to use for sampling from the color swatches. Go to Window -> Color Panel -> Color Set which puts Color Set Libraries panel on your screen. Click in the upper right pop-out menu of panel and select New Color Set from Image. Name and select the number of colors, just like in Photoshop’s Indexed Color dialog box. Say okay and it automatically adds the swatches to the bottom of the Color Sets listed. To remove, just click on pop out and select Color Set Libraries – just remove the check mark by clicking on it and it disappears. This is much easier to create your swatches than in Photoshop, but it is harder to remove colors you do not want to keep as there is no Preset Manager – icons at the bottom of panel must be used. I do not use this feature as much in Painter since there are several other ways to sample colors (for example, loading the artist’s image in the Mixer Pad, using it as a Reference Image, or adding it as a source in Clone Panel).